I've been reading the PBR Guides and in Vol2 it gives you guideline values for diffuse colors. 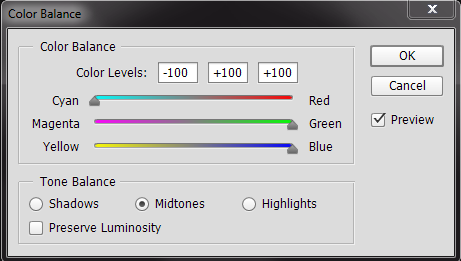 should not have any values that go above 240 sRGB"
How do I check what values my colors/textures are in Photoshop? I'm trying to get some good green values for leaves that will work in a PBR workflow. How does the levels command give a numeric reading? I need a numeric reading. The Levels command only shows the graph. Ok It looks like the Info Pallete in Photoshop will give you exact RGB read outs wherever you hover over your mouse on your image. One thing I don't understand though is the guidelines in the PBR Guide book only give you ONE number for a guide. Example: No darks should go below 50 srgb. I assume they mean that no value in any of your 3 RGB channels should go below 50? as far as I know there is no such an option in photoshop, but I would use a workaround for this. Create a Levels adjustment layer and select the mask (rectangle next to the levels adjustment). What I would do then is to go to 'Select -> Colour Range'. This way you see if you have any values fitting in your range. If you click on OK now, this selection is used as a mask inside the levels node. Now you can edit the Output Levels and all values should be lifted. You also could do the levels node without having to select the colour range, but to see those values this trick is quite useful and you also could use this as a mask for anything. You also could use it to check if your levels work correctly. You can even make an action to automate the process :auto levels then set the low and high to the proper values. That said it's feasible in SD as well, I am pretty sure. it will transforms the RGB value into what should be the Srgb values when converted to the proper color profile. but the file remains to be in RGB profile, so it could only be used to check the final result, but nothing you can really use for production. Just to clarify. Using the Info pallete near the histogram will NOT give me accurate values when I hover over a pixel? In my picture it shows my green is in the 50-240 range. It's showing 123 in the info pallete. Does that not mean I am in the acceptable range if I wanted to use this green for a leaf color? Please see attached. Thanks for the help. the Info Panel gives you exact values. You can use it, of course. Once again, you don't need to do it "by channel" : you can do both channel at the same time. then you setup the output levels. Hello, sorry for digging out an old thread, but as this is in the learning category, and people will still be using these topics for reference (like I was just now), I think this is important. Let's assume we're using the strict rule (min 50 sRGB). I tested it in Designer, using the "PBR Albedo Safe Color", "PBR BaseColor / Metallic Validate" and "Uniform Color" nodes (plus additional Uniform Color node to test stuff with the color picker). When you start with dark green color (0,52,0), Validate gives thumbs down (it's too dark), and Safe Color converts it to (48,52,48). Grey, which is obviously not what we wanted. But, if you start moving the Value slider up in Uniform Color (HSV mode), at 88 Validate gives full thumbs up. Which is simply (0,88,0). Still green color, which is what we wanted. This shows that individual channels can be below 50 (even 0), and still satisfy the restrictions. Which makes sense, because if you convert a (0,88,0) color to black & white for example in Photoshop, it gives a (51,51,51) value, which is in the safe range. This would suggest that it's the overall value (greyscale value) that matters, not individual channels. HOWEVER (and I wonder if this is a bug), I noticed something weird: for the "PBR BaseColor / Metallic Validate" node, (0,88,0) is OK, but (88,0,0) and (0,0,88) are not. In fact, for red, (175,0,0) seems to be the minimum, and for blue even (0,0,255) is not accepted... Is this by design, resulting from some real-life properties of colored materials, or simply a bug? I don't think it's a bug. (88,0,0) reads at ok for Albedo at the 30 srgb range. These are just approximations. The node wasn't designed to be used with a single uniform color. For (0,0,255) I get the green result. Are you using the albedo or metal mode? For metal, this would show incorrect.